The Department of Interior’s imminent decision on whether to place polar bears on the federally protected endangered species list has focused attention on a recent study that documents for the first time the way that Arctic sea ice affects the bears’ survival, breeding, and population growth. If current ice melting trends continue, the bears are likely to become extinct in the southern Beaufort Sea region of Alaska and adjacent Canada, the study concludes. Using extensive data of polar bears collected by U.S. Geological Survey scientists from 2001 to 2005, a research team including Hal Caswell of the Woods Hole Oceanographic Institution (WHOI) and Christine Hunter of the University of Alaska determined that climate change in the Arctic is dramatically reducing polar bears’ survival and reproductive rates. The study concluded that melting Arctic ice is a critical threat to the bears’ survival. 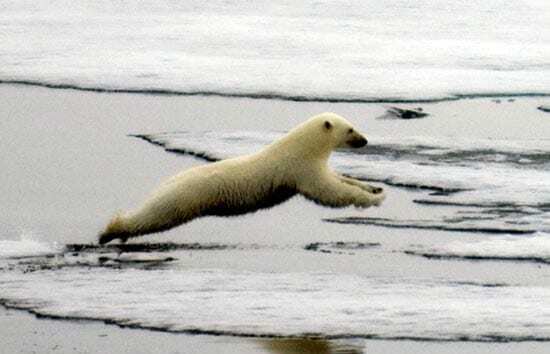 Polar bears need ice as a platform to hunt for their main food source: seals. 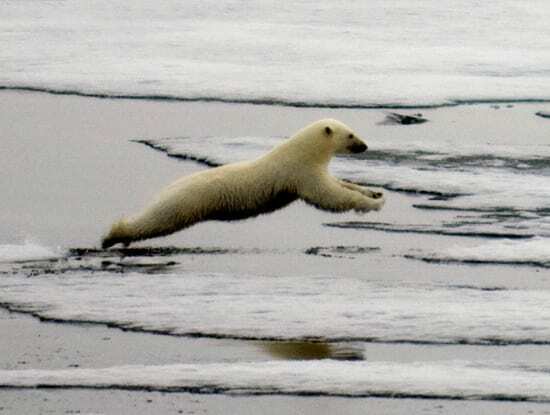 As the Arctic Ocean became more ice-free over more summer days in 2004 and 2005, polar bear breeding and survival declined below the point needed to maintain the population, the team found. The population can withstand occasional “bad-ice years,” but not a steady diet of them. Some climate studies project that summer Arctic ice may disappear by mid-century. If it does, the polar bear will follow soon after, the scientists say, with two-thirds of polar bears disappearing throughout their entire range. Interior officials were scheduled to make their decision on polar bears on Jan. 9, but postponed it for a month, citing the complexity of the situation. The long legal process to be considered for listing under the Endangered Species Act began in 2005, when the nonprofit Center for Biological Diversity (CBD) filed a petition with the U.S. Fish and Wildlife Service (FWS). The FWS began an initial review of the petition in February 2006 and received more than 500,000 public comments—both supporting and opposing. On Jan. 9, 2007, the FWS formally proposed listing the polar bear as “threatened.” In the language of the Endangered Species Act, a species is “endangered” if it is in danger of extinction in at least a significant portion of its range. It is “threatened” if it is likely to become endangered in the foreseeable future. The FWS would take steps to protect the species in either case, but a threatened listing is more flexible and lets the government make “special rules tailored to the species’ needs.” The proposed listing triggered another yearlong process, and FWS turned to its research arm, the U.S. Geological Survey (USGS) for further information. The USGS had recently completed a painstaking study of one of the 19 polar bear populations in the Arctic—the one living in the Southern Beaufort Sea, off the coast of northern Alaska and adjacent Canada. From 2001 to 2005, USGS researchers searched for bears, tranquilized, measured, and tagged them, gave them lip tattoos to identify them, removed a tooth to measure the bears’ ages, and then released and tracked the bears in a “mark-recapture” study. 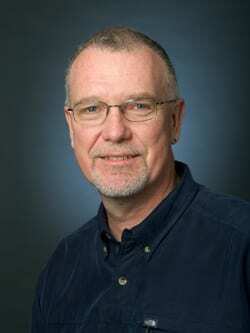 In March 2007, the USGS enlisted Caswell and Hunter, mathematical ecologists who specialize in population dynamics models, to advise the team. They used new analytical methods, developed while Hunter was a postdoctoral investigator at WHOI, to develop new models that incorporated USGS-collected information about polar bears’ mortality rates, birth rates, life cycles, and habitats. 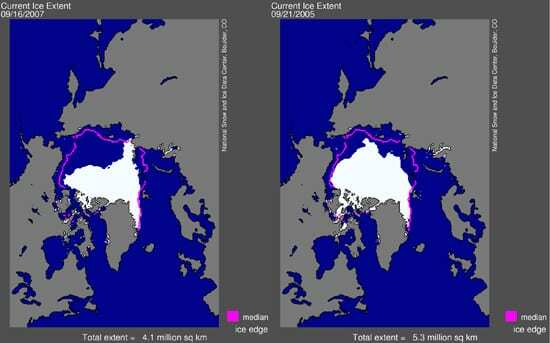 They coupled these models to projections of Arctic climate changes, especially forecasts of sea ice conditions. They calculated the interplay of all these factors—“some 10,000 simulations,” Caswell said—to estimate the probabilities of future polar bear population growth or decline. Like other predators at the top of the food chain, polar bears have a low reproductive rate. One or two cubs are born in midwinter and stay with their mother for two years. Consequently, females breed only every three years. The bears don’t reproduce until they are five or six years old. From late fall until spring, mothers with new cubs den in snowdrifts on land or on pack ice. They emerge from their dens, with the new cubs, in the spring to hunt seals from floating sea ice. (In many languages, they are more fittingly called ice bears. They are unipolar, inhabiting only the Arctic, an ice-covered ocean, not the ice-covered continent of Antarctica.) Simply put, if there isn’t enough sea ice, seals can’t haul out on the ice, and polar bears can’t continue to hunt. In each of the first three years of the USGS surveys, the near-shore ice melted an average of about 100 days, and the Southern Beaufort Sea polar bear population grew about 5 percent per year. But in 2004 and 2005, the number of “ice-free” days increased to about 135, and the population declined by about 25 percent per year. During the same period, polar bear researchers in the Arctic reported seeing things they had never seen before: emaciated bears, starving bears, bears drowning, and bear cannibalism. 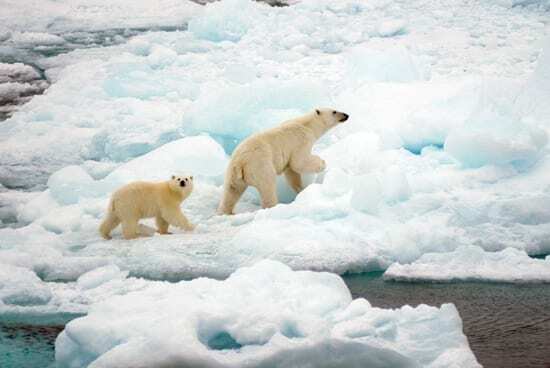 The population models created in the study suggested that 130 “ice-free” days is a threshold, constituting a “bad-ice” year that has negative impacts on the polar bear population. The frequency of “bad-ice” years is critical: If they occur too often (more often than once every six years or so), the bear population shrinks, the scientists said. All the climate models examined predict that bad ice years will occur more often in the future, as the Arctic warms. That projects a dire future for polar bears, though some small populations might hang on in isolated regions where ice remains, Caswell said. Caswell and Hunter, along with USGS polar bear biologists Erich Regher and Steven Amstrup; Michael Runge from the USGS Patuxent Wildlife Research Center in Maryland; and Ian Sterling from the Canadian Wildlife Service, issued two reports on the Southern Beaufort Sea polar bears, in September 2007. They were among nine reports presented to the FWS and USGS administrations and to U.S. Secretary of the Interior Dirk Kempthorne. Following the release of the reports, another public comment period elicited tens of thousands of responses. Supporters of adding polar bears to the list of threatened species included the National Resources Defense Council (NRDC), the U.S. Marine Mammal Commission, and 51 members of Congress. Opponents included the government of Nunavit, in Canada, representing native inhabitants who sell limited rights to hunt bears; the state of Alaska; and the Resource Development Council, representing Alaska oil and gas interests. Many of the opponents invoked uncertainty as their main criticism. The Resource Development Council claimed that “all major studies by the USGS are filled with uncertainty and doubt.” And in an op-ed piece Jan. 5 in The New York Times, Gov. Sarah Palin of Alaska said, “There is insufficient evidence that polar bears are in danger of becoming extinct within the foreseeable future, ” adding that “the possible listing of a healthy species like the polar bear would be based on uncertain modeling of possible effects” [of climate change]. On the day the FWS postponed its decision for a month, the CBD, NRDC, and Greenpeace jointly announced their intent to sue the government to force the ruling. If Interior Secretary Dirk Kempthorne decides to designate polar bears as threatened, critical habitat areas could be designated in the future, and federal and state agencies would be prohibited from authorizing, funding, or carrying out actions that “destroy or adversely modify” critical habitats of the species—which could include permitting of mining and drilling operations. American hunters would no longer be able to bring into the U.S. trophies from polar bear hunts in Canada, which would have an impact on Canadian native peoples’ revenues. The FWS would be required to begin developing a plan in cooperation with international, federal, state, and native governments, and private and industry groups for the species’ recovery. If climate change and melting Arctic sea ice are the cause of polar bears’ decline, reversing it may be enormously difficult. In this, the bears’ situation contrasts with another endangered species, whose demography Caswell has also analyzed: the North Atlantic right whale. from the Federal Register (Vol. 72, No. 5), Jan. 9, 2007.